Sure, there was a lot to look at in this old church – columns that dated from the 11th century, a very interesting World War I memorial, stained glass, and so on. 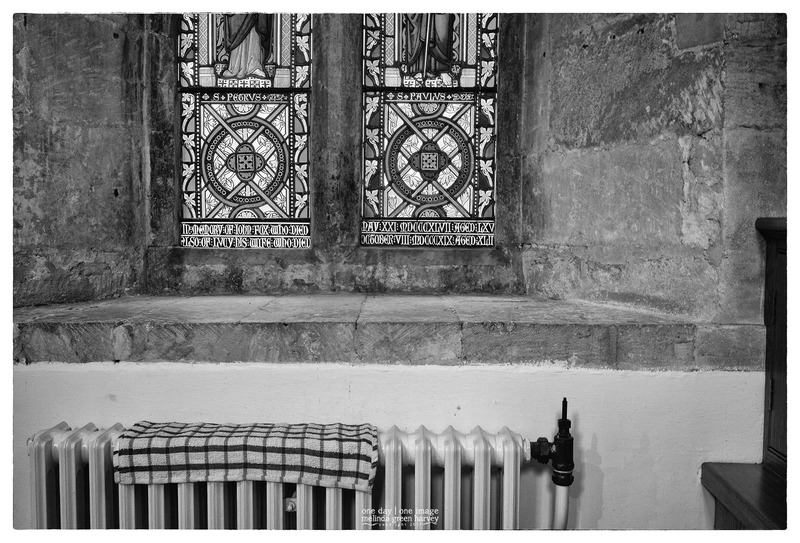 But of course it was the dish towel, drying on a radiator under a stained glass window, that captured my attention. Photographers were asked to donate £2 and wear a sticker that identified us. Of course, I made the donation. And I kept the sticker, too. In case I ever need Official Photographer cred. Also – the funeral of The Who’s bassist, John Entwhistle, was held in this church in 2002. So, there’s that. Posted on July 5, 2017, in Photography and tagged 365 photo project, architecture, black and white photography, church, england, John Entwhistle, learning to see, Leica, melinda green harvey, monochrome, one day one image, photo a day, photography, postaday, St. Edward's Church, stow-on-the-wold, thoughtful seeing. Bookmark the permalink. 2 Comments. Thanks, Richard. Finding things like this always makes me happy.